My 5: Sangkhlaburi Town Market, Thailand. 1. April 2015. There are a number of markets to be found scattered in and around Sangkhlaburi, including the famous Night Market in Mon Village, as well as the curious Border Market with its antique oddities by the crossing to Myanmar. I checked out the sedate Town Market near Oh Dee Hostel between Thetsaban streets one and two. It’s a wonderfully laid back affair: almost entirely local, deserted in the mid afternoons and closed on weekends. 2. April 2015. 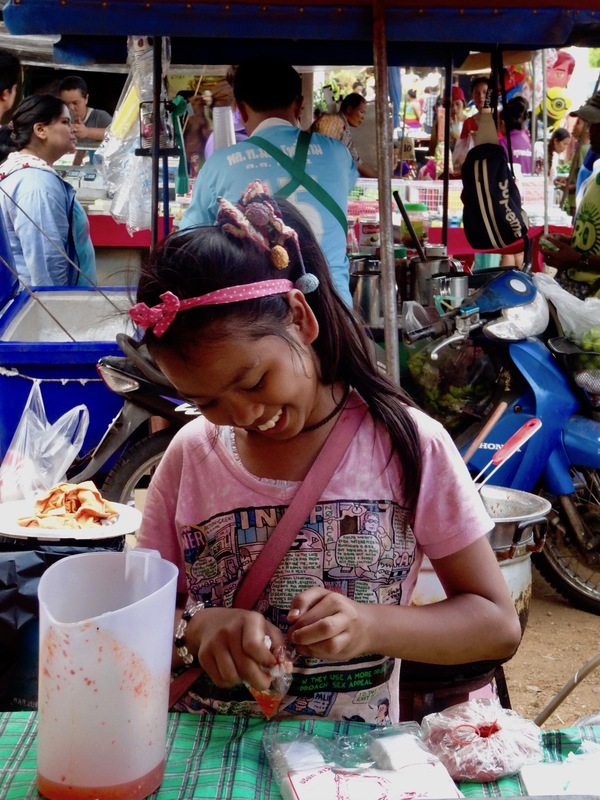 For me Sangkhlaburi Town Market was a fun place to come and people watch rather than a place to actually eat. Fish products take up a large section, which did nothing for me, especially these stinky slabs of salty dried fish. The stall owner was cheerfully swatting away a near-constant barrage of bugs. 4. April 2015. 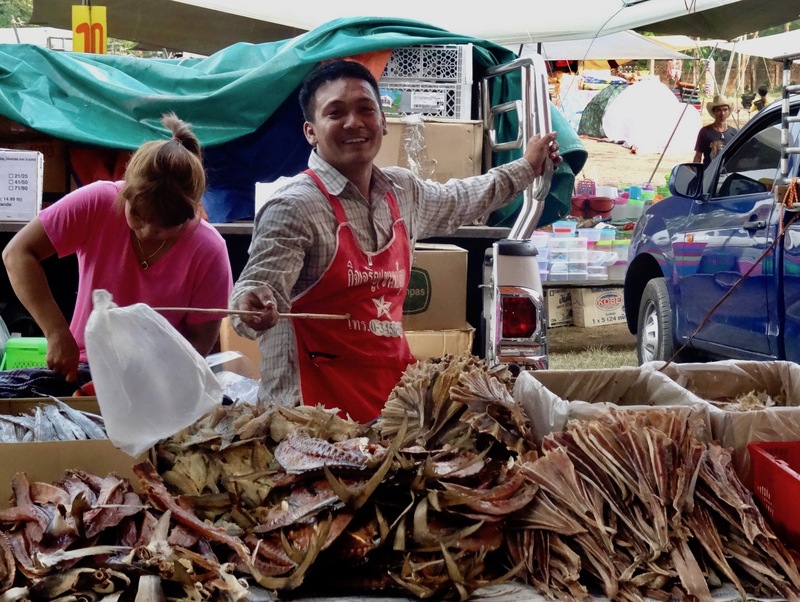 Mostly comprised of raw fruit and veg, the market does offer some cooked local snacks. This girl was helping her mum at a fried chicken station: mama doing the actual cooking, her daughter tying up little bags of accompanying sweet chili sauce. 5. April 2015. Sangkhlaburi Town Market is pretty small, you can do a full loop in about fifteen minutes. Catering mainly to locals rather than foreign tourists, I wasn’t given the hard sell once and the stall owners were a mostly friendly bunch happy to smile for photographs. 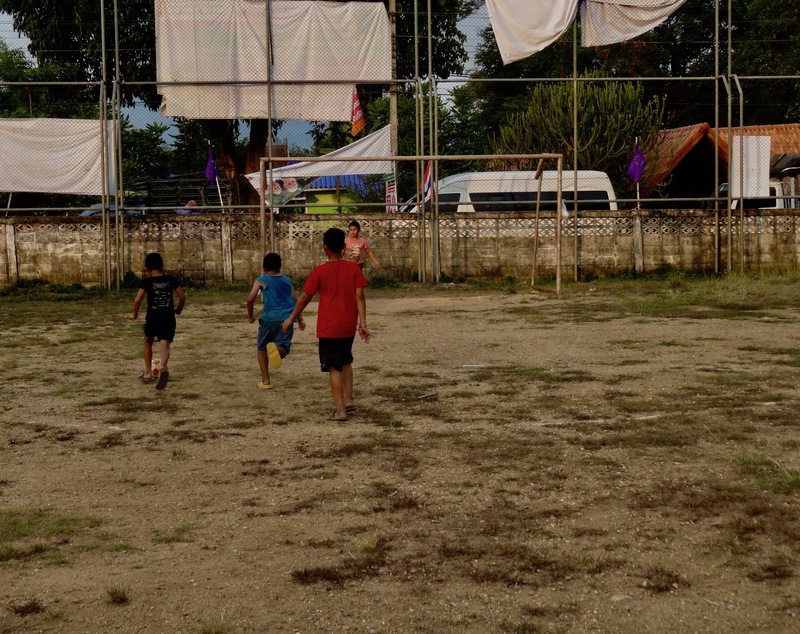 Set in a large, scraggly park, local boys also come here to play football between a set of rusting, net-less goalposts. My 5: Wat Wang Wiwekaram & Buddhakaya Chedi – Sangkhlaburi, Thailand. My 5: F.B. International School – Siem Reap, Cambodia.